How can I enter warehouse locations and bin locations? The functions for managing warehouse locations (only in the "Business Trade" package) can be found under "Settings - All settings - Master data - Products: Warehouse locations". The screen will list all warehouse locations defined in bexio. Add new warehouse locations by pressing the "New warehouse location" button. 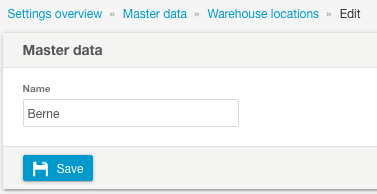 If you want to edit a warehouse location, left click it, make the desired change and then press "Save". Alternately you can also delete a warehouse location by pressing "Delete". To create a bin location (only in the "Business Trade" package), a warehouse location must first be defined. 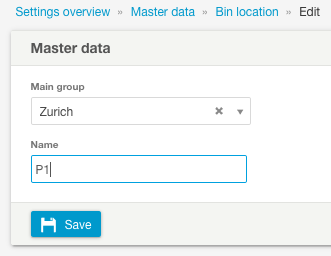 The functions for managing bin locations can be found under "Settings - All settings - Master data - Products: Bin locations". The screen will list all bin locations defined in bexio. Add new bin locations by pressing the "New bin location" button. If you want to edit a bin location, left click it, make the desired change and then press "Save". Alternately you can also delete a bin location by pressing "Delete". How does the warehouse work? Export – What options does bexio offer?